Asbestos from a derelict building travelling through the air to affect people nearby. Spilt oil travelling through the drainage system to a nearby river. 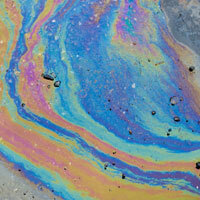 Chemicals in leaking drums travelling down through the soil into an underground water supply. Air emissions from a factory being carried by the wind to a nearby nature reserve which is being harmed as a result. Significant harm, including harm attributable to radioactivity, is being caused. There is a significant possibility of this type of significant harm being caused. Pollution of controlled waters is being caused. Pollution of controlled waters is likely to be caused. Significant harm in relation to human beings includes serious injury, death, disease, genetic mutation, birth defects, cancer or impairment of reproductive functions and mental dysfunctions because of the effects of a pollutant on the body. Controlled waters means any coastal waters including territorial waters seawards for three miles, inland freshwaters, including waters in lakes or ponds, rivers or other watercourses and waters in underground strata (known as groundwaters). You can get more information about controlled waters from our section on water pollution offences. When we are looking at what might be harmed, we are interested not only in humans but also buildings, protected habitats, and crops or farmed animals. Wherever these are facing significant harm as a result of land based pollution, it might be necessary to designate the site as contaminated.